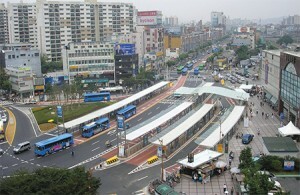 The bus transport reform in Seoul came together at many levels including the establishment of a new institutional and regulatory framework, the restructuring of operation and management of bus services, and the alignment of the investment programs to environmental concerns while ensuring greater quality of services for consumers. In the early 1950s Seoul began to reform its urban transportation system in response to rapid demographic changes. 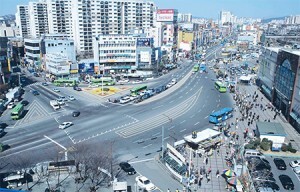 Since then, Seoul has experienced population growth of at least fourfolds within fifty years, and real income growth of at least forty times. Such dramatic changes lead to scarcity of land, rise in housing prices, and traffic congestion in the capital. As a result, overcrowding forced migration into the surrounding suburbs where more than 12 million people now reside. The existing transportation infrastructure could no longer sustain the changes in transportation patterns that have shown increase in the average length of trips and number of daily trips per person. Between 1970 and 2002, the total number of daily trips increased five times, from 5.7 million to 29.6 million, for populations in outer portions of the suburban areas. A continuously growing economy ensures additional growth in travel demands concentrated in these areas. Private transportation quickly gained popularity as means of traveling throughout the 1980s and 1990s, while the former, buses and taxies were largely disregarded. The rise in the number of passenger cars contributed the most to the increase in travel and total number of automobile registered. By 2010, 30 percent of the population owned cars jumping from only 0.5 percent in thirty years. Previously, buses were the primary means of transportation for over eighty percent of the daily commute; the remainder was taxis (17.6%) and subways (1.1%). The share of buses began to fall sharply as subway lines came into operation, but much of the drop is attributed to rise in private car use. In addition, during the same period governments attempted to reduce traffic congestion by adding more buses, and granting more licenses to private bus and taxi operators. The existing infrastructure was no longer capable of digesting such large increases in private car use, thus resulting in serious traffic congestion within the city and on radial arterial highways connecting the suburbs to the central city. Congestion costs were estimated to exceed $10 billion a year, amounting to 4% of GDP by 2010. Increased car use has also caused high levels of air pollution, noise, traffic accidents as well as excessive use of scarce land for roadways and parking facilities. 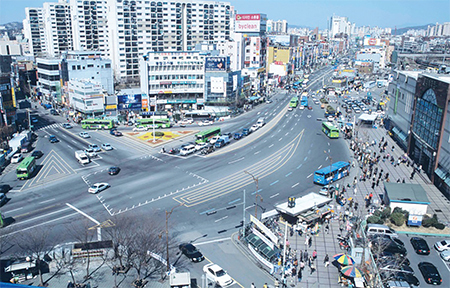 To deal with such problems, the Seoul Metropolitan Government centered its efforts on expanding Seoul’s transportation network. It has been implemented in three stages: (i) the development of a mass transit system from 1950 to 1980, (ii) the restructuring of the bus system using ICT, (iii) and the implementation of a new strategy of transport demand management (TDM) in urban land use plan.